Alice Marie Sharpnack was born on December 21, 1930 in Malvern, Iowa to Benjamin and Ora (Sullivan) Smith. She graduated from Malvern High School and married Harold Sharpnack on May 21, 1948. They moved to the Huxley area in 1959. 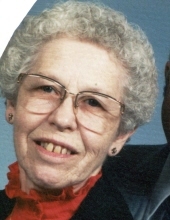 Alice was a member of Fjeldberg Lutheran Church and the American Legion Auxiliary. Her family was the most important thing to her. Alice died December 10, 2018 at her home in Huxley at the age of 87. She is survived by her husband, Harold of Huxley; six children, Sandra (Todd) Flemmer of Huxley and Patsy Quintus of Tenino, Washington, Tom (Linda) Sharpnack of Huxley and Randy (Carol) Sharpnack of Cambridge, Connie (Al) Woody of Springfield, MO and Mary Klonis of Phoenix, AZ; 15 grandchildren; 20 great grandchildren and two great-great grandchildren. Alice was preceded in death by her parents; a son-in-law, Jerry Quintus; a child, Rich Thompson; a great grandson, Gage; two brothers and two sisters. Soderstrum Funeral Home in Slater is assisting the family with arrangements. Condolences and photos may be shared at www.soderstrumadams.com. A celebration of life service will be held at a later date. In lieu of flowers, donations may be made to Huxley Fire and Rescue Association. To send flowers or a remembrance gift to the family of Alice Marie Sharpnack, please visit our Tribute Store. "Email Address" would like to share the life celebration of Alice Marie Sharpnack. Click on the "link" to go to share a favorite memory or leave a condolence message for the family.